A Trump-appointed labor arbiter is under fire for reversing one of the Obama administration's most controversial rulings, leading to a conflict of interest complaint that could hinder future appointees. William Emanuel joined the National Labor Relations Board (NLRB), the agency in charge of settling workplace disputes and overseeing union elections, in September, giving the GOP control of the five-member board for the first time in a decade. The Republican majority wasted little time in reversing some of the Obama administration's most consequential rulings. The biggest turnaround came in December when the board ruled in Hy-Brand Industrial Contractors that parent companies could not be held liable for labor violations perpetrated by franchisees or subcontractors unless they played a direct role in committing the violation. The ruling reestablished a decades-long joint-employer standard that the Obama-controlled board overturned in 2015. The decision sparked public outcry from labor organizations, which have long targeted franchise businesses for unionization, as well as an ethics complaint alleging Emanuel should have recused himself because of his previous work with Littler Mendelson, a management-side law firm that has disputed the Obama board's interpretation of the joint-employer standard. On Feb. 9, NLRB inspector general David Berry issued a memo, first obtained by Law 360, stating Emanuel "should have been recused from participation" in the Hy-Brand case, calling it a "serious and flagrant problem." The memo led Sen. Patty Murray (D., Wash.) to demand the board "reconsider its decision without member Emanuel’s participation," according to Bloomberg. Former NLRB general counsel Jerry Hunter said the inspector general's interpretation of ethics standards "went too far" to the point of being "unworkable." The agency and courts traditionally reserve recusal for personal ties to a case, such as when boardmembers have previously represented a client. But the inspector general went one step further, according to Hunter, calling for recusal if a boardmember's old employer took a position on the issue at hand. "There's no way you can say that because a boardmember represented a client dealing with an issue that boardmember is forever foreclosed from deciding on that issue," Hunter told the Washington Free Beacon. "If you limited the pool of [boardmembers] based on if they had ever taken a stand on labor issues as an attorney, you'd have to appoint people with no experience in labor law." The NLRB declined to comment on the matter. Roger King, senior labor counsel at the Human Resources Policy Association, said the inspector general's memo departs from longstanding precedent regarding recusals to the point of being "severely deficient factually and legally" and "defied logic and sense." The Hy-Brand case may have dealt with the same joint-employer issue as the Obama board's Browning Ferris decision, but the similarities stopped there; the case featured different law firms, different companies, and different facts, according to King. The most striking aspect of the IG's interpretation of ethical guidelines is that it seemed to apply to management-side attorneys, rather than lawyers who had represented labor unions in the past. "One of the larger concerns here is the weaponization and the politicization of the inspector general's office and the general ethics code," King said. "No boardmember has ever been accused of conflicts of interest because of his prior legal assignments—union or management. [The IG's] preclusion approach is without precedent and flat-out wrong." Matthew Haller, a spokesman for the International Franchise Association, said the joint-employer standard adopted by the Obama board has caused chaos among franchise businesses, which employ millions of people. IFA praised the board for its Hy-Brand decision, but the fallout from it reiterated the organization's push for a legislative answer to take the matter out of the hands of regulators. In November, the House of Representatives passed the bipartisan Save Local Businesses Act to shield parent companies from labor violations committed by franchises or subcontractors. The Senate has yet to take action on the bill. "This IG report only adds to the confusion facing local business owners everywhere. Congress still remains the only practical avenue for codifying a sensible definition of joint employer," Haller said in an email. "It is incumbent on the U.S. Senate to take seriously its responsibility to enact a permanent, legislative solution." Berry's memo could carry implications beyond the joint-employer standard. 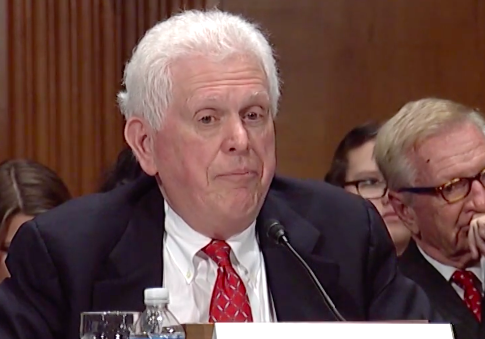 Hunter, the agency's former general counsel, criticized the inspector general for focusing solely on a management-side attorney in his review of conflicts of interest. "It is totally one-sided," he said. "The Democrats are crying wolf over something they never raised as an issue when it comes to former union lawyers issuing decisions." King urged boardmembers on both sides of the aisle to dismiss the memo in the interest of preserving the "credibility of this agency." Undermining Emanuel's position to rule on relevant labor law could also cast doubt on any other boardmember—union- or employer-side—who has represented a client in the past. "This report and its so-called logic would effectively preclude anyone with experience, particularly from the management or an independent or international union, from issuing decisions," he said. "[The IG] has done great harm to the credibility of this agency and future nominees and their ability to be confirmed and rule thoughtfully.… I would hope the board members, both Democrats and Republicans, will strongly rebuke this report." NLRB chairman Marvin Kaplan, another Trump appointee, has told Congress the agency is reviewing its conflict of interest standards in light of the memo. This entry was posted in Issues and tagged Big Labor, Obama Administration, Trump Administration. Bookmark the permalink.